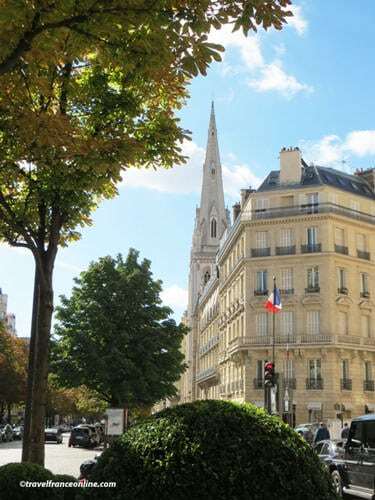 The American Cathedral in Paris is located in the prestigious Avenue George V.
Don't confuse it though with the American Church, which is located at no65 Quai d'Orsay on the Left Bank. This being said, you can’t really miss the American Cathedral. You’ll easily recognize its 85m tall spire as it peaks above the roofs of the Right Bank. It's one of the tallest in Paris! 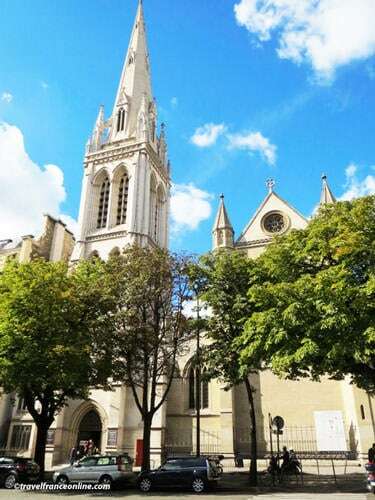 The Cathedral of the Holy Trinity, as it is formally known, is an Anglican Episcopal church that serves the American community living in Paris. You don’t need to be of American nationality to attend services. 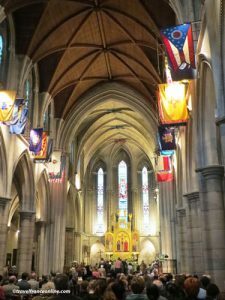 The cathedral is indeed open to all and welcomes all denominations. The current and 10th Dean is a woman who is proud to be the head of a welcoming, active, committed and diverse community. Dare to enter as you walk along no23 Avenue George V, you'll be pleasantly surprised! 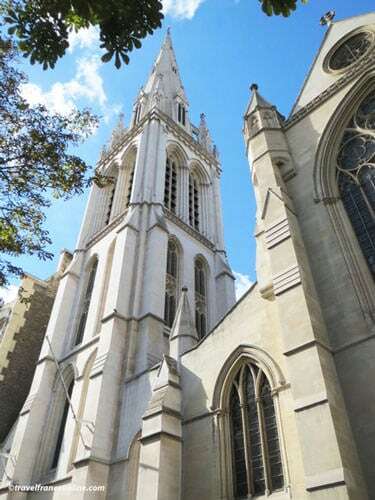 The beginnings of the American Cathedral in Paris go back to the 19th century. The American Anglican community, who lived then in Paris, attended religious services in various buildings. 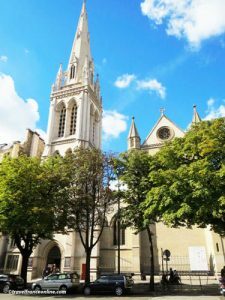 A much needed church was built in 1864 in the nearby Rue Bayard. However, it soon became too small to serve the growing community. The rector of the time therefore purchased a plot of land along the current Avenue George V and entrusted the architect George Edmund Street with the construction. The Church of the Holy Trinity was consecrated on Thanks Giving Day, November 25, 1886. This date coincided with the dedication of the Statue of Liberty in New York! 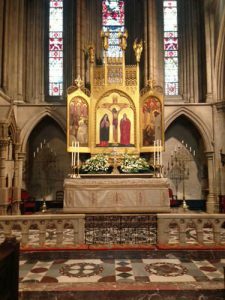 It was consecrated as a cathedral in 1922 and you’ll easily understand, as you visit it, why it has since been classified Historical Monument. You’ll fall under the charm of its beautiful neo-Gothic architecture (the favorite style of George Edmund Street) as soon as you enter the large front porch. The Deanery and outbuildings are laid out around the Dean's Garden. This lovely and secluded area is used to host various small outdoor functions during the nice season. The arches of the Cloister delineate the northern side of the garden. Sheltered from the street, you feel transported to the soothing atmosphere of a country monastery, far from Paris! The cloister is very impressive, not for its size but for its symbolic value. It was designed as a memorial to the American soldiers and civilians who were killed during WWI. The American Ambassador in France Myron Herricks and Marshal Foch dedicated it on May 30, 1923 in the presence of President Raymond Poincaré. Seven commemorative marble slabs are affixed on the wall separating the Cloister from the cathedral. The French Foreign Minister and the American Ambassador in France unveiled them on June 24, 1994. The artist Rudi Bass created these slabs in order to commemorate all civilian and military victims, of all nationalities, who died during WWII. You'll find the entrance to the cathedral by the Cloister. You'll be impressed by the size of the building. 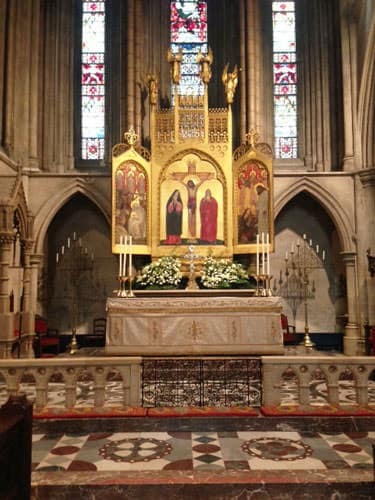 It's indeed 144,5m long by 21m wide and 17,5m high with a 16.5m high chancel! These are indeed in complete harmony with the neo-Gothic style of the building. The interior of the American Cathedral in Paris contains many more interesting features. Among these are the 42 stained glass windows created between 1883 and 1893 by the Bell and Beckman workshop in London. Each window illustrates a section of the Te Deum Laudamus and beautifully stands out against the surrounding stone and marble. The cathedral is round the corner from the Champs-Elysées, Louis Vuitton flagship store, Arc de Triomphe and the Flame of Liberty-Princess Diana Memorial.